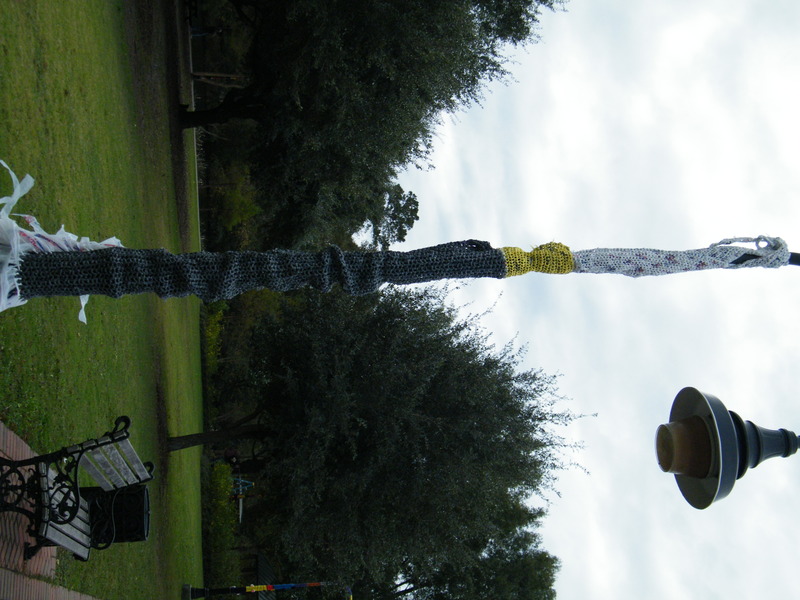 Dancing with Wool, a public art project, was sponsored by Lion Brand Yarn, Create Conway, Conway Glass, and Conway Downtown Alive! 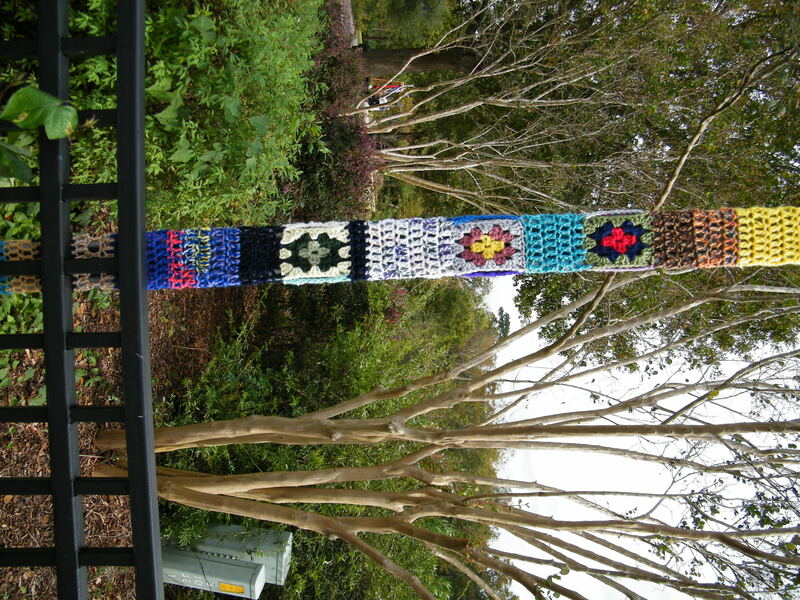 This is Conway South Carolina’s Riverfront Park on the beautiful Waccamaw river in Downtown Conway. 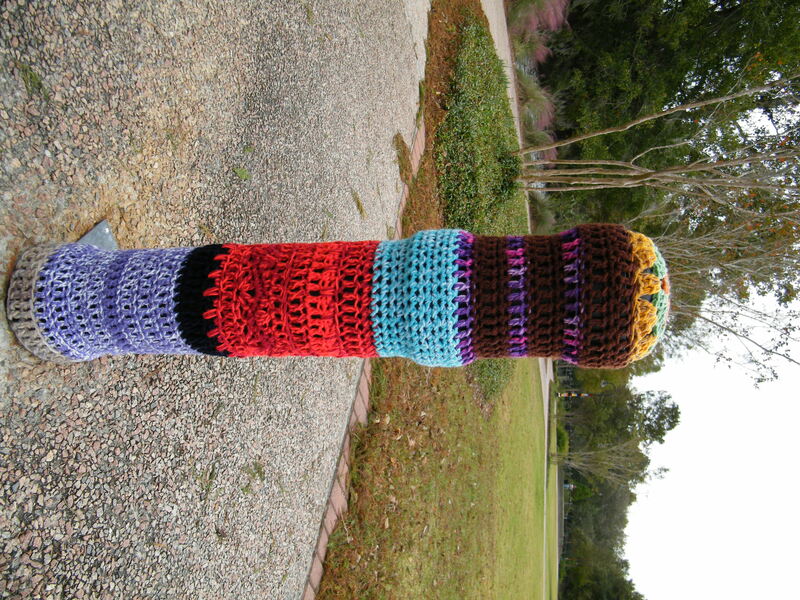 This is the light pole I bombed. 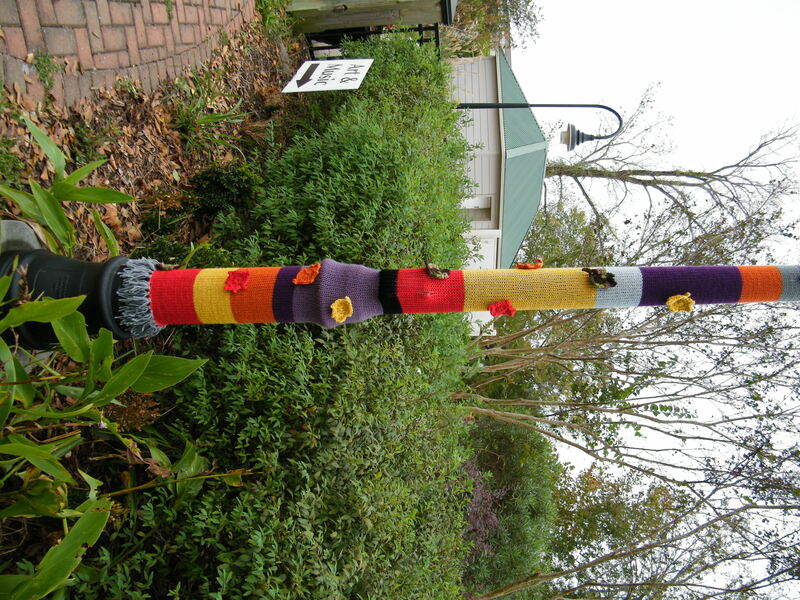 Hurricane Sandy delayed the installation a day later and this Sunday morning bright and early Dixie Knitters, Create Conway members, and … myself….. started. Sandy brought in windy cooler weather so it really gave an atmosphere of fall, the perfect time for wool to be out in all it’s glory! Courtney was working on her’s and this is what it look finished with wonderful leaves scattered and falling! 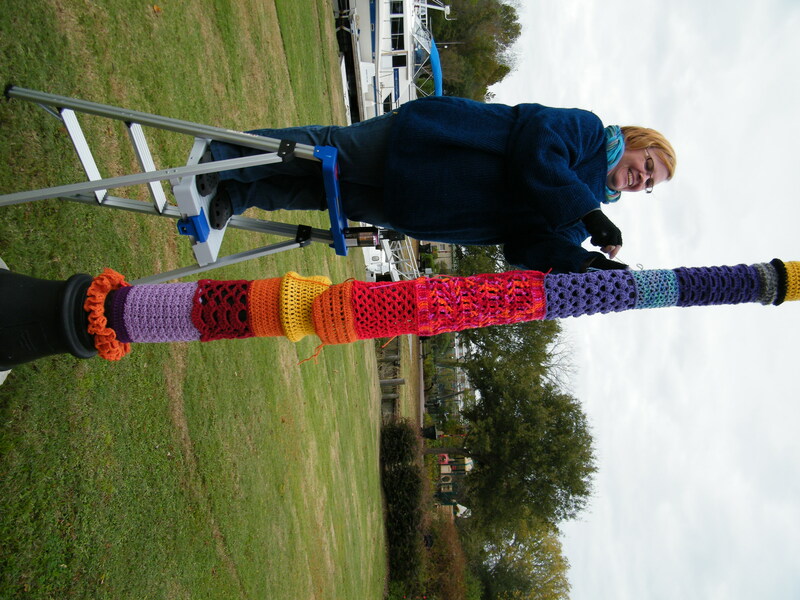 Teresa crocheted wonderful mottifs and patterns on her pole. Rhonda made several… One was a can-can girl and the other was a recycled baby made of plastic grocery bags. 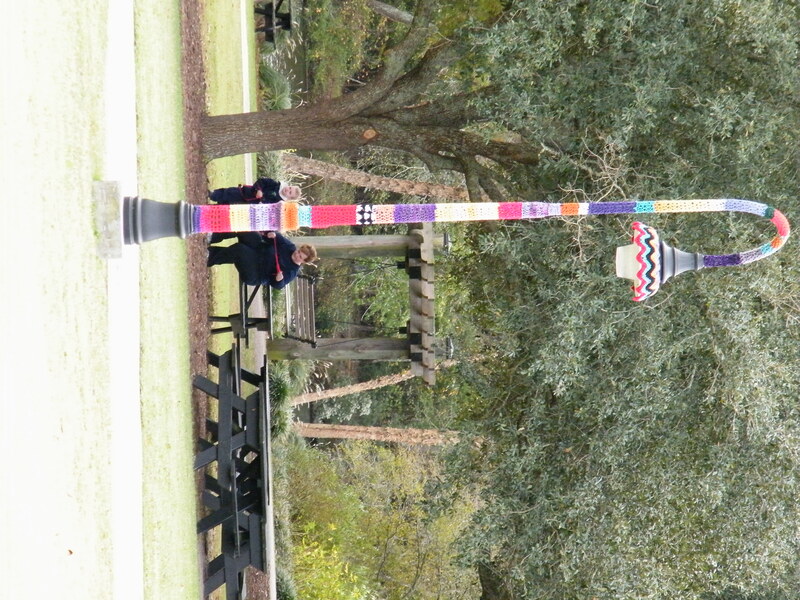 Emily crocheted several pieces also, and I love the look of this random , non-light pole. 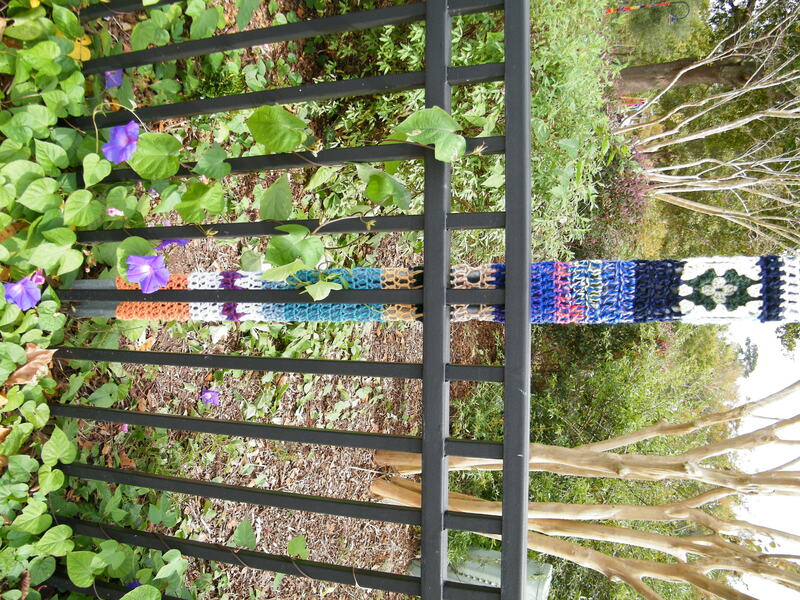 Oh and look at the bottom, I love the flowers both real and crocheted! I love this one and I do not know who was the artist… so, speak up and leave a comment if this is yours so I can give credit and that goes for all the rest pictured…. Love it! I used the same leaf pattern as Courtney too, because I love fall. They’re all so pretty, and that flapper one was amazingggg. 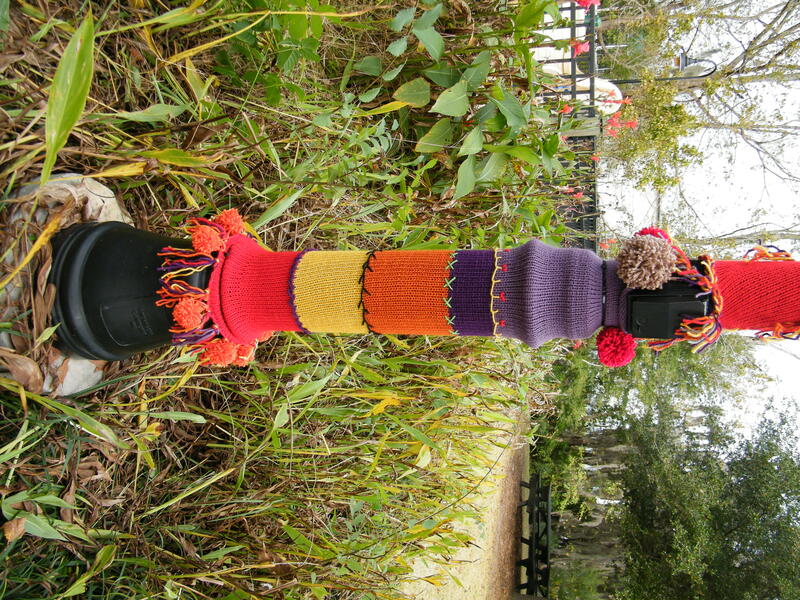 I have to go back and re-post the flapper pole now that Rhonda has it finished with the beads and top! Thanks so much for posting the great pictures! 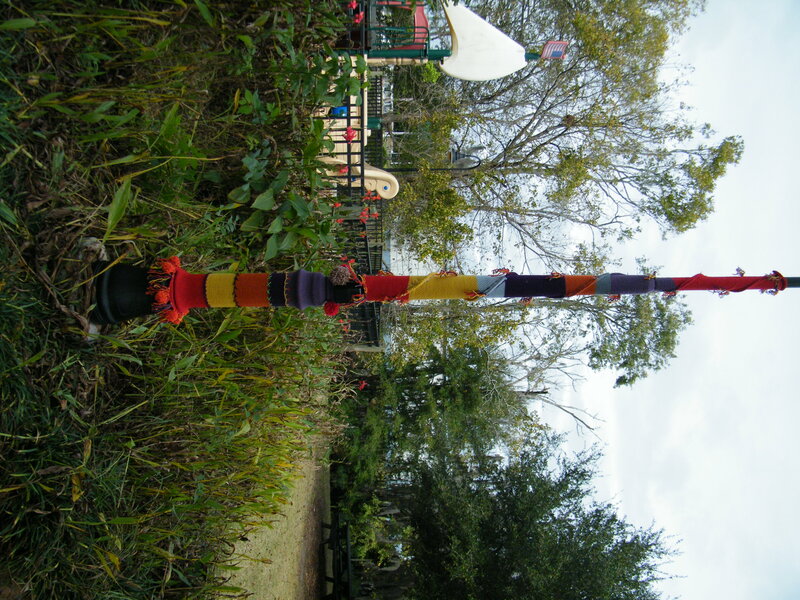 The light pole with the zig zag top, and the short pole with the beanie top are mine! Awesome! Thank you for commenting and letting me know, Boy EMily you sure out did yourself and I love all your work! The park looks so fun and festive right now! This must be Terri! Renee Smith linked to your blog. 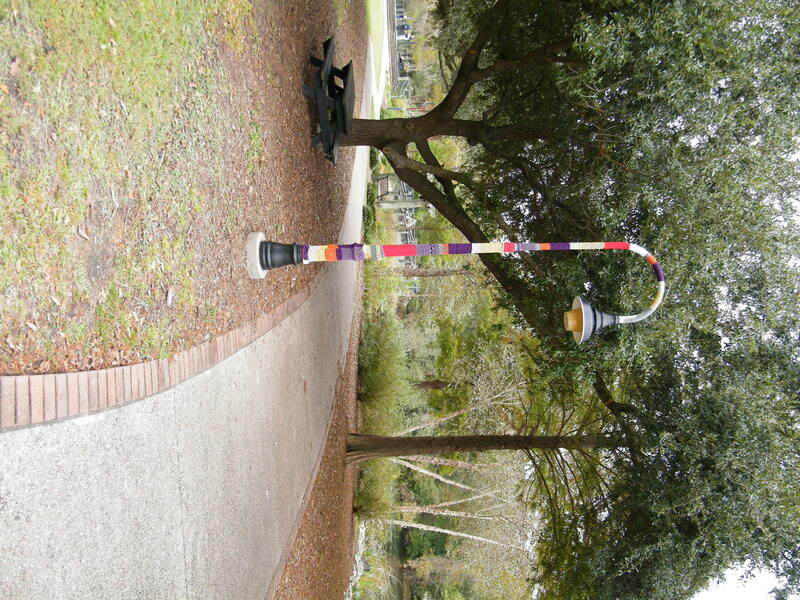 The lightpost in picture #6347 is Emily Smith’s, as well. 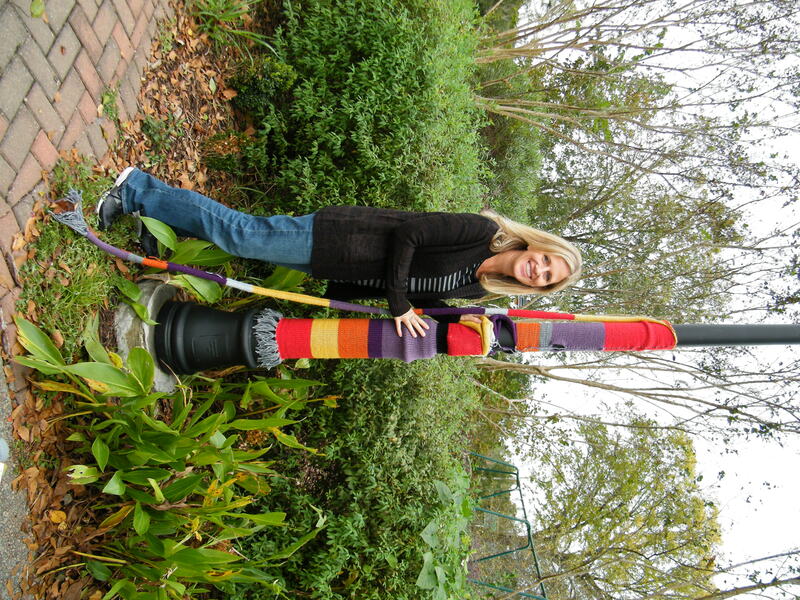 Terri…what a fun project!!! Love your decorative stitches & pom-poms. 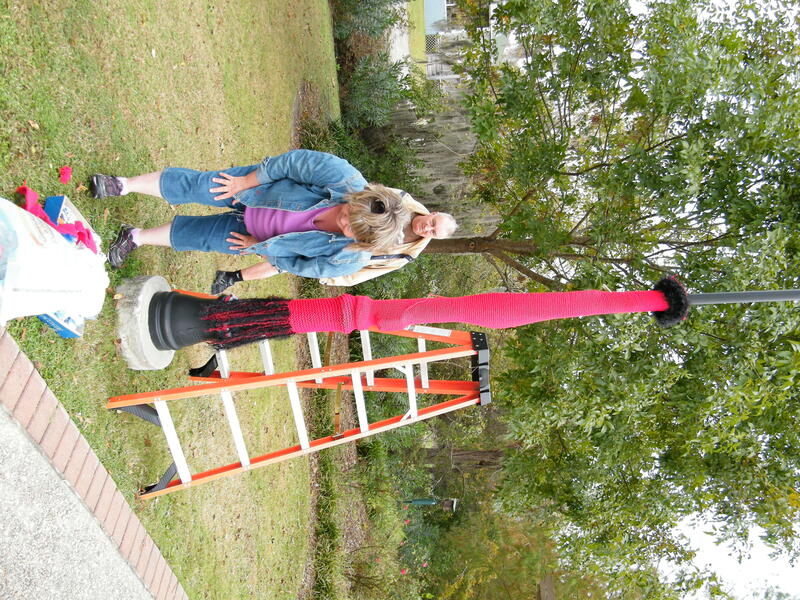 Kathy Diehl I did the last lampost pictured. really enjoyable experience . Oh thank! They all look wonderful! 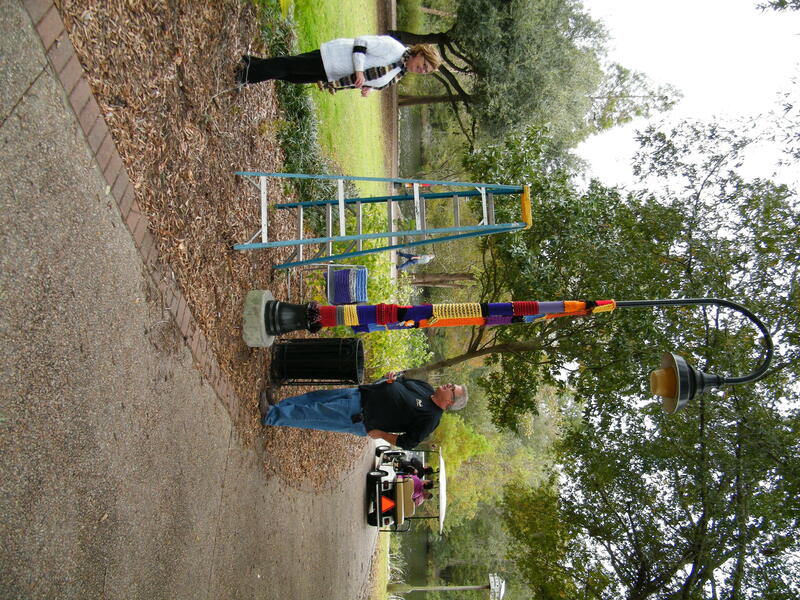 That is such an awesome and pretty thing to do for the city! The poles look so great. I never realized you were in Conway, SC! My MIL lives in Myrtle Beach, my sis-in-law lives in Surfside, and I believe her husband is city planner or zoning coordinator (something like that!) for Conway. We are in Myrtle twice a year. We should get together the next time I’m down there! I am very proud of all my “dancers” and of all the people that worked so hard to make this project a success.